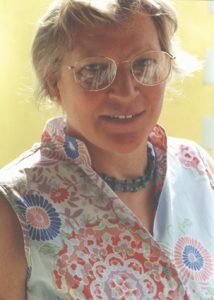 Jenny was born Jennifer Campbell in 1944 in Bangalore, India. She moved to Scotland in 1948, followed by a move to Harrogate in Yorkshire in the mid 50’s. She studied fine art at Harrogate School of Art and then got her Diploma in Art and Design at Sunderland School of Art. After college she moved to St Ives in Cornwall, where she met and later married Dai Vaughan. They exhibited paintings at the Penwith Gallery and set up their first business Magic Murals, painting discotheques, and backdrops which responded to sound and light creating the illusion of movement and changing pictures and patterns. This work culminated in designing and painting the exterior, the entrance stairway and the stage of Bumpers Discotheque in Piccadilly, the largest dance venue in Europe at the time. 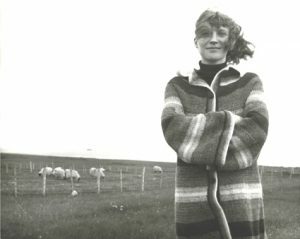 In 1973 she and Dai and their two young children moved to the Isle of Lewis. There they lived a self sufficient life while restoring their 1829 manse built by Thomas Telford. In the late 1980’s they worked on the mainland, mainly in and around London, where they completed a number of commissions for trompe l’oeil rooms, and 1986 moved permanently to Glasgow. Here they worked on a large number of public and private commissions. Following on from this they completed a series of twenty four gesso panels for the Dining Room of The House for an Art Lover, designed by Charles Rennie Mackintosh and Margaret Macdonald. Their final commission was the gesso panel centerpiece for the Salon de Luxe of the newly renovated Willow Tea Rooms, now called Mackintosh at the Willow, completed in 2018. Examples of these commissions can be seen on our Vaughan art-works.co.uk web site. Whenever there was a space of time between these various commissions Jenny worked on her own paintings, which can now be seen in the Gallery.